In recent years establishing own data collection operations has become a powerful journalistic tactic for putting neglected issues on the public agenda and advocating and intervening in official monitoring, measurement and data production practices. I wrote about the importance of own data production in journalism a couple of years ago in an article for the Harvard Business Review. Among these data collection initiatives in journalism, counting operations have emerged as one particularly prominent type of intervention, from counts of drone strikes and their casualties, to migrant and mine worker death counts, and counts of killings by police. For the “Changing What Counts” report I reviewed two examples, one based in Europe and one in the US, where journalists have successfully set up and conducted death count operations. 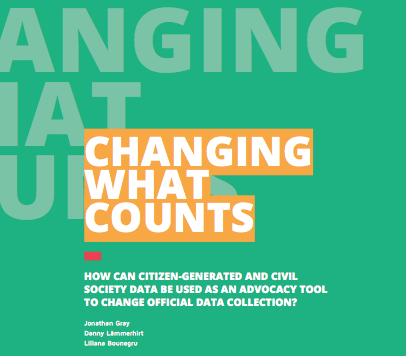 The report has been published yesterday by Open Knowledge and the CIVICUS DataShift initiative and can be accessed here. This entry was posted in Data journalism and tagged civicus, data collection, data journalism, death counts, guardian, migrant files, open knowledge by liliana. Bookmark the permalink.